Fiat – an italian automobile company, always original and innovative, also called “the child of Masserati” brings us a small (length only 4 meters) fighter with 5 stars EuroNCAP safety. The car was designed to pass most strict safety conditions in its segment. Run unbelievable 60 crash tests with 5 star result for a passenger protection, 3 stars for pedestrians and 3 for children protection. 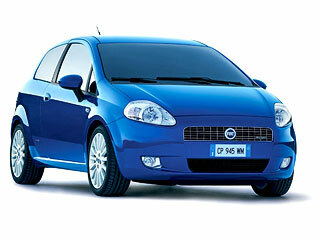 A lenght of 4 meters makes the new Punto a leader of its class. It provides enough inner space for passengers both in front and rear. But mostly the big wheel base makes him “tuning approved” and also provides great stability. The 3-doors Grande Punto has 6 engines in line-up. There are three gas engines and three diesel with the Common Rail Multijet injection system. We can find 6-speed manual transmission providing drive comfort and low consumption by cooperation with 1.3 Multijet 16V (90hp) and 1.9 Multijet (130hp). An italian tuning firm Lester presents a hi-quality body-kit just for this 3-door model. This body-kit push this model on top-ranks between small modified cars. Lester makes this daisy more unique. the Sport character is built not only on the new body-kit but also on a new color called “funny orange.”. The Front bumper wasn’t drastically modified, but has only a decent facelift, which changes the car’s character significantly. Foglamps are situated in stock position but bottom part is expanded with something like a lip. We can find eyebrows over the front lights. My first look is quite scary, why the eyebrows on the lights are expanded so far from the front mudguards. But after some time, it looks fancy, characterizing the shape of headlights. Quite interesting is an attachment on upper-side of the hood, which hides the wipers and improves aerodynamics of the car. Similar modifications are also anywhere, but in that case it’s only a metal plate attached on a hood and expanding it. It’s the same like to dark hood but from the opposite side. It’s a designer’s job which covers unwanted wipers in a nice way. Lester does this with plastic attachment. Sidelong doorsteps have sharper edges and they’re shape is copying the whole car – front part inclined forward, bottom to up and wide it nicely. We can found a fancy air dam with triangle shape. the rear bumper was modified by a lip with diffuser imitation, with two oval shape tips looking upwards. The rear air dam has an aggressive image of powerful sport car, also thanks by diffuser imitation. the duplex exhaust tip isn’t only a cheap imitation, but it’s a complete exhaust system with two sport (intermediate) mufflers. The trunk wasn’t modified – it has a tuning style by stock production – smooth without handle only with Punto and Lester logos. The roof has a new plastic spoiler in the car’s color. Smooth edges make the rear part more harmonic and dynamic. Grande Punto Lester stands on H&R foot with MAK Valeno wheel disks in unbelievable size of 7x17“ and tyres YOKOHAMA Parada 205/45/ZR17. I must confess that I love small and powerful cars – so if I’ve buying the Grande Punto, I would have also add this Lester body-kit. I hope that all owners of the car and all enthusiasts of optical tuning will like these accessories. The delivery time is about 14-20 days from the day of order, if these parts aren’t available. Special orders and build-to-orders have their own delivery times. Manufacturer provides full warranty for 24 months. We recommend assembly by specialized companies because of demanding installations. The Lester company was found in 1973, situated in Trecate, northern Italy, nearby Milan. Everything started in a little laboratory. More passion than only work. They’d manufacturing spare parts for racing cars as Porsche, Stratos and Abarth 131. It was the era of first spoilers on stock cars to make them more competitive and original. That made Lester a worldwide producer. They’ve rapidly broaden their line-up from the day of their 13th birthday. Today’s line-up has about 4000 types of spoilers so they cover nearly the whole European market. All their products satisfy aerodynamics and design functions and they don’t change the structure of the car in any way. Of course, Lester’s spoilers are certified and homologized in EU and have TUV (Technischer Ü berwachungs-Verein) and DEKRA (Deutscher Kra ftfahrzeug-Überwachungsverein) certifications. Lester is also able to design and produce special parts build-to-orders. 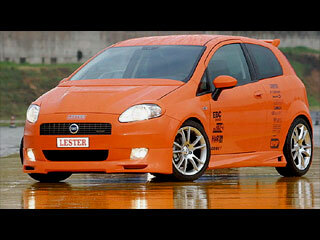 Do you like the new Fiat Grande Punto tuning by Lester?